I must confess that it has been several years since I last pulled out my oud and read through Dimitrie Cantemir’s Kitab-i ilm-i musiki, so I may be less qualified than some to review Saturday’s concert by Hespèrion XXI. But I know my own experience of the afternoon, and I can certainly recount the lengthy standing ovation by a nearly sold-out crowd that closed the two-hour concert. It was a remarkable performance, full of Ottoman, Sephardic, Greek, and Armenian music, and performed on the sorts of instruments foreign even to many regulars of the Boston Early Music Festival. Certainly it was one of the most disconcerting concerts of the festival, but that turned out to be not at all a bad thing. The music had a serene, timeless feel, as though each piece could have begun many centuries ago, and could continue for several more. The melodies, played almost exclusively as solos or in unison, rarely offered a major or minor third to ground the music in a key; rather, ambiguous intervals like the fourth, fifth, or murky and menacing augmented second dominated. There was the constant drone, played by any instrument, but never evolving or changing harmonically; the lack of sharp, distinguishable attacks and releases of notes, from Savall’s seamless vielle bowing to the freely ringing decay of the santur; and the total insignificance of rhythmic precision in the drone. This constant layering of sound, ever present, harmonically static, and loose in its construction and instrumentation, is quite far removed from the sort of rhythmic vitality and harmonic activity associated with standard western repertoire. Add to that the seamless transitions between pieces within a set, and the effect was really quite striking. Bach and Mozart fans are accustomed to a sort of musical narrative, in which themes develop, harmonies evolve, and melodies become protagonists with trials, tribulations, and ultimate resolutions. This music, by contrast, is content to unhurriedly enjoy a particular ambience, while focusing its interest on timbral diversity and the shaping of beautiful melodies. If there was a reason that those two hours flew by, apart from sheer novelty, it was due to the men in charge of those many exotic timbres. Savall’s group functions as a flawless, completely engaged ensemble, but their real strength lies in bringing the wonderful colors of these ancient instruments to life. Haïg Sarikouyoumdjian’s duduk was the star of the evening, with its many opening solos and eerie, inconsistent colors, sounding here like an oboe and there like the bizarre lovechild of the soprano saxophone and modern flute. 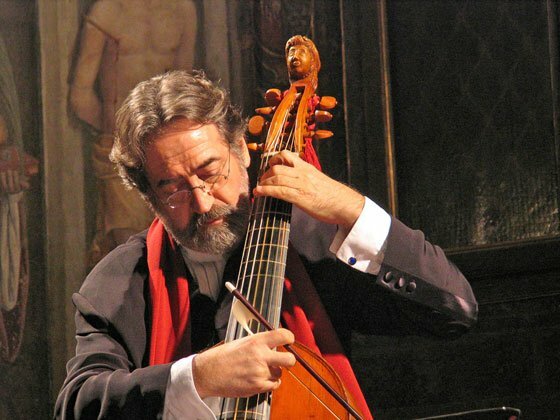 Sarikouyoumdjian employed some sort of wide, fast vibrato that sounded unlike any instrument from any modern orchestra, and when paired with Savall’s vielle, it sounded unlike any instrument of this earth. David Mayoral’s percussion was another highlight, particularly the incredibly vocal exclamations drawn from the depths of his doumbek. Hakan Güngör’s glissandi on the metallic, mystical kanun never failed to impress, while Yurdal Tokcan and Driss El Maloumi imbued their ouds with the appropriate moods. Savall, presiding over all, redefined entire atmospheres with a single brush of the bow: a wispy, scratchy sound with a touch of vibrato for moments of trepidation, and a commanding, aggressive stroke for more assertive passages. Above all, the sound of these incredible instruments made it impossible not to feel ever so slightly unstuck in time; their ancient foreignness was utterly transporting, and their seemingly infinite combinations made it impossible to predict what color would emerge next. As for the actual music, it could be difficult to distinguish, let alone follow in the program. Some pieces apparently followed Estampie form, according to a rather intelligent friend of mine; others seemed reminiscent of jazz, with a recurring unison melody interspersed with jam sessions for each instrument. There were mournful laments, joyful dances, and, towards the end, tunes so traditionally tonal and metrical they seemed almost comical in the established context. Musically, it was captivating beginning to end, including the encore: Savall dedicated these three culturally diverse versions of the same tune to his late wife. If this review seems less than entirely technical, again, my oud lies sadly fallow on the shelf. If it instead seems overly concerned with the otherworldly effect of the performance, it is only because the music, instruments, and fabulous musicians compelled a mental change of scene. Checking my watch at 3:05, I truly could not remember if the concert had started 5, 35, or 65 minutes earlier; more importantly, it was all so fascinating and thrilling that I didn’t even seem to mind.